Do you feel like you don’t have a space where you can meet other parents or carers who have similar experiences with their disabled children? At Unique Kidz and Co we want to provide support for every aspect of your life with a disabled child, so you can also meet other parents who have similar experiences. Having a place where you know your disabled child can play in a relaxed and safe atmosphere will help you to enjoy the experience. Through our Stay and Play Sessions, you can meet other parents or carers and their children, playing and chatting alongside them in our amazing facilities. Our Stay and Play Sessions are open for both disabled children and their siblings, aged 0 to 5 years old. With a calm and fun atmosphere, both you and your children are sure to have fun! Led and supervised by our highly qualified Play Workers, your children will learn play skills with a small group. The sessions are on Wednesdays and Thursdays, focusing on different aspects, such as social and motor skills, that are vital for children to acquire. This session provides a chance for an informal meeting with other parents. Come along to have a chat with people who can relate to your experiences whilst you enjoy a nice cup of tea and watch your children play. 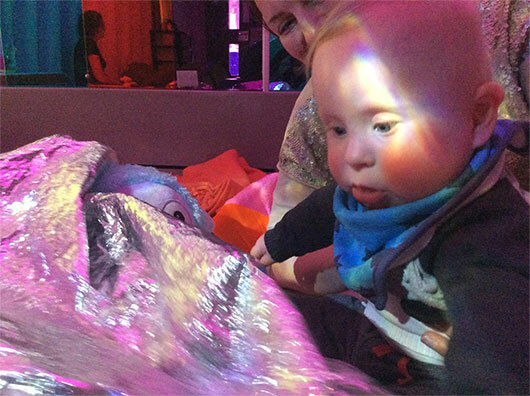 Hands on and interactive, this session gives parents or carers time to spend with their children in our sensory room that helps to develop essential skills. Providing both children and their parents or carers with the perfect play area for a relaxed and fun learning environment, our Stay and Play sessions are ideal for your unique children. To know more about the activities, get in touch with our friendly team on 01524 831132.